This page is set up to help users with the process of becoming subscribed to certain wiki articles. 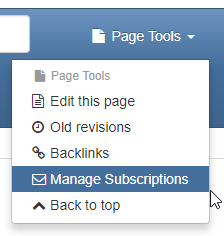 Being subscribed to a wiki will allow you to get notifications when the page is updated with any changes. This is useful for pages like the Release Notes, and any others that may change often. Locate the wiki article which you would like to receive updates for. Click Page Tools on the main page header (navigation bar) as shown below. In the Subscribe section, you may subscribe to notifications for the current page or all pages which are denoted as an asterisk (*), please select your preferred choice. In the Receive section, select the notification option you prefer. We recommend the digest email of changes for each page so that you are not notifying each time an individual edit to a page is made in a given day. You are now subscribed to the wiki article of your choosing, and will receive updates at the email address that you use to log into the website.